I bought a new wallet and while cleaning out the old one I found a single porcupine quill tucked into one of the credit card compartments. I have no idea where it came from. My grandparents live on a farm in Canada. Once, while visiting, I took the difficult path along the side of the lake – the one that usually only the dog takes, while people cross by canoe. 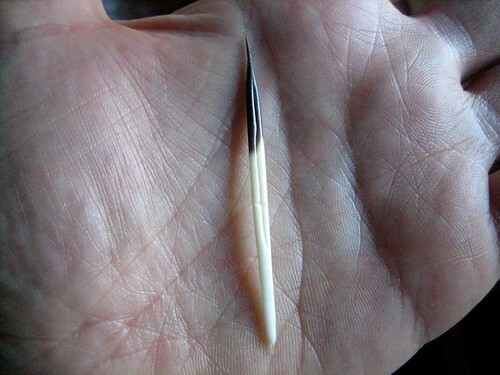 On the steep bank under the fir trees I found the remains of a porcupine: skin and quills. Sacred. I took a few of the spines and when I got back to the house I carefully put them into a matchbox which I carefully stashed in the cup holder by the driver’s seat in my car, and which I never saw again. I don’t know how I lost them when I was being so attentive, but it seemed right. Must not have been okay for me to take anything from that animal. So the other day when I found the treasure in my purse it felt like full circle. I’ve been given back one quill. This entry was posted on Tuesday, February 12th, 2008 at 12:42 am	and is filed under a few of my favorite things, today, travel. You can follow any responses to this entry through the RSS 2.0 feed. You can leave a response, or trackback from your own site. My response was EXACTLY the same as “buddha_is.” I was going to say, “Lovely.” So, I guess you get two “lovely”s at once. Perhaps I can say serendipity instead…a lovely serendipity, although that’s redundant it seems to me. that is a wonderful story and also partly magical. It made me speak after reading along silently for most of a year. As always, I love your posts and photos, but I can’t help feeling like it’s more a sign that you should go back and visit the grandparents.. or that your wallet really needed that cleaning out. i have been think ing about how holding things transforms them. and this photo does it for me. It is the photo of the hand that has me facinated, so like a landscape or the view from a plane.